That title refers only to the weather! My earlier post of 300+ days of sun and December temperatures in the 60's is not to be believed. They were anticipating snow yesterday, yep y'all, snow. Thursday night they announced schools would be shutting down at noon - just in case. Joel reports seeing a few flakes. However, the sun finally reappeared and the temperatures continued to drop. Last night's temperatures were predicted to be 24 - 35-degrees. Locals we've chatted with more than make up for the chill outside. They are warm and welcoming and more than ready to visit. Tourist bureaus everywhere could learn from this city whose unofficial motto is "Keep Austin Wierd". 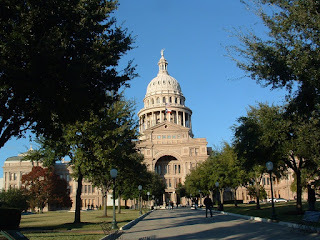 We've seen an ecclectic mix of cowboy, urban hippie, business folks and visitors as we've bundled up in long johns and layers of clothing to explore this pedestrian-friendly Capitol of the Lone Star State. Tonight the town welcomes Christmas with songs and celebration. Christmas carols will be sung on the steps of the Capitol. It was refreshing to see a Christmas tree in the chamber of the House of Representatives. Instead of arguing about symbolism, as our state does, here they are celebrating the state of Texas with each representative having an ornament on the tree with a scene depicting the area they represent. For example, Tyler, known for its roses, has a beautifully decorated globe with red roses on it. And none of this Happy Holidays - this morning the man in front of me at Starbucks turned and wished me in no uncertain terms a "Merry Christmas!"